Preakness Day has always been special for Jockey Jesus Castanon. In 2011, he guided Shackleford to victory in the Grade I Preakness, the second leg of the Triple Crown. Now, seven years later on Preakness Day, he scored another memorable victory aboard a Shackleford filly that he raised as Shackira Shackira rolled off her second straight win at Indiana Grand Saturday, May 19, less than 30 minutes after the blazed-faced chestnut Justify won the 2018 Preakness Stakes at Pimlico Racecourse. Owned by Castanon's wife, Rolanda, and trained by his brother, Jose, Shackira Shackira was supposed to make her next start at Indiana Grand on the turf course, but rain earlier in the day moved it to the muddy track. Castanon wasted no time getting the three-year-old blazed-faced filly onto the lead in the one mile, 70 yard race. She was accompanied on the outside by Dirty Dixie Road and Rodney Prescott as the field of five moved around the first turn and down the backstretch of the $17,000 claiming event. Shackira Shackira was well in hand for Castanon at the top of the lane before the duo strode off from the competition, opening up to a four-length lead and moving under the wire for the win. Greedy American and Marcelino Pedroza closed well for second over Dirty Dixie Road for third. For the Castanon family, Shackira Shackira now has two career wins in five career starts. 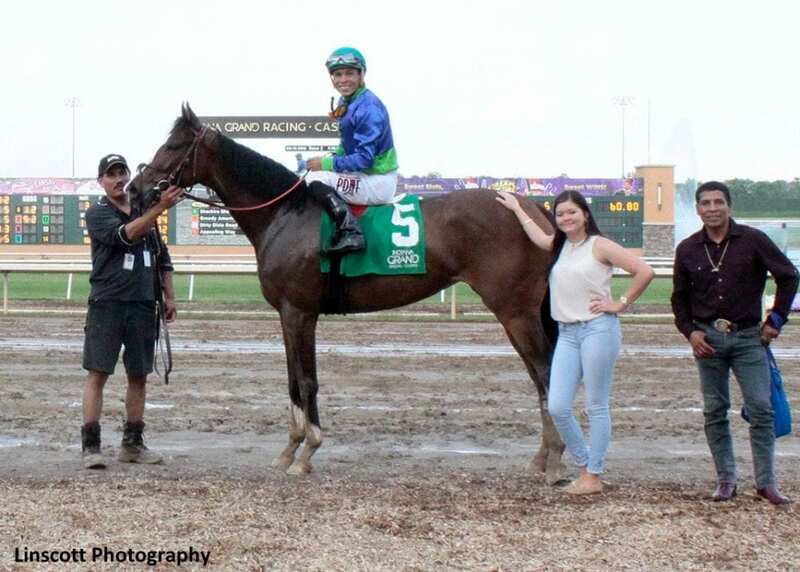 After starting twice last fall as a two-year-old, she made her Indiana debut a winning one in early May, breaking her maiden by more than 10 lengths. Shackira Shackira is a product of Castanon's relationship with Shackleford's connections. After winning the Preakness aboard the striking chestnut, he received a free breeding to the horse when he was retired in late 2012. That prompted Castanon to seek out a mare that was suitable to breed to Shackelford and Miss Dora was the perfect choice with a total of $169,000 in career earnings and a winner of four races. Shackira Shackira inherited a fiery spirit from Shackleford, one that she carries with her onto the racetrack. However, Castanon likes that and sees a lot of comparison with his filly to Shackleford, including her big white blaze. The younger sibling (Miss Shack) doesn't possess as much white, even those she also has a small blaze on her face. Castanon sees a difference in Shackira Shackira from last year to this season. He explained her first three starts were over sloppy tracks and she had some rough trips where she got knocked around a little. Therefore, they decided to give her some time off to regroup before her first start at Indiana Grand and it has made a big difference. Castanon is currently juggling a busy schedule, riding at other tracks besides Indiana Grand. The multiple Graded Stakes winning jockey is among the top 10 riders at Indiana Grand this season. He has more than 2,400 career wins and in addition to his victory in the Preakness aboard Shackleford in 2011, the duo came back to finish second in the Breeders Cup Dirt Mile later that year. Trained by Dale Romans and owned by Michael Lauffer and W.D. Cubbedge, Shackleford returned as a four-year-old in 2012 to win the Grade I Clark Handicap with Castanon aboard before retiring to stud with more than $3 million on his card. Shackleford now stands at Darby Dan Farm in Lexington, Ky.
Castanon still visits Shackleford frequently. He will forever have a bond with the big chestnut that gave him his first Triple Crown win. Now, he has even more reason to celebrate his success as Shackira Shackira carries on the family name straight to the winner's circle. This entry was posted in People and tagged Indiana Grand, jesus castanon, jose castanon, preakness, shackira shackira, shackleford by Press Release. Bookmark the permalink.